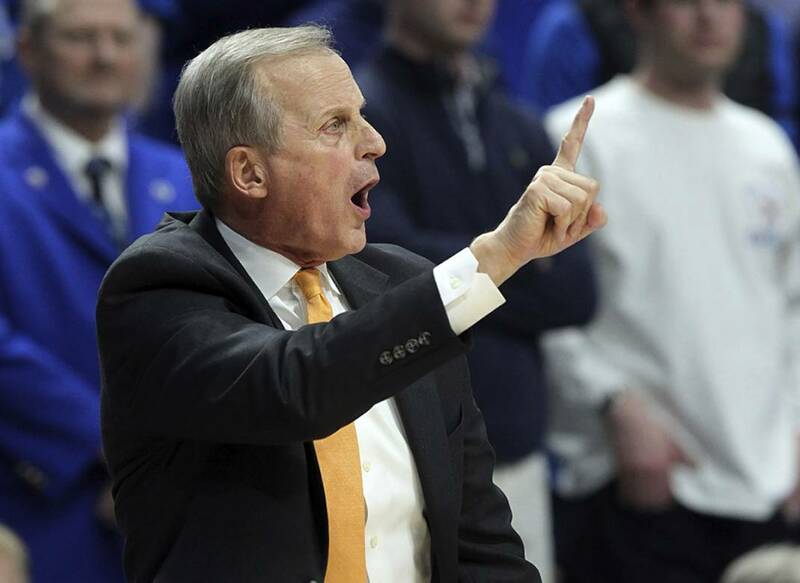 Tennessee men's basketball coach Rick Barnes calls a play during the second half of Saturday night's game at Kentucky. LEXINGTON, Ky. — Leading by six points at the break, the fifth-ranked Kentucky men's basketball used a 14-0 run to start the second half and was up by 24 before winning 86-69 against top-ranked Tennessee on Saturday night at Rupp Arena, halting the Volunteers' program-record winning streak after 19 games. The Vols (23-2, 11-1 Southeastern Conference) are back at home Tuesday to face Vanderbilt (9-16, 0-12), which has lost 13 straight games but did take Tennessee to overtime Jan. 23 in Nashville before losing 88-83. With Saturday's loss, Tennessee fell into a tie for first place in the league with 19th-ranked LSU (21-4, 11-1), which beat Kentucky 73-71 on Tuesday. Kentucky (21-4, 10-2) is alone in third in the SEC standings. Tennessee's Jordan Bone scored a team-high 19 points and had six assists, while Admiral Schofield had 17 points on 7-for-18 shooting with six rebounds before fouling out. Grant Williams scored 16 points and had a team-high eight rebounds. He did most of his work with free throws, making eight of nine. Tennessee never really had an answer for the Wildcats' P.J. Washington, who finished with 23 points on 9-of-12 shooting. Kentucky shot 55 percent from the field, becoming only the second team this season to top 50 percent against the Vols. The other, Kansas, defeated Tennessee 87-81 on Nov. 23 in a neutral-site matchup. Kentucky's Keldon Johnson had 13 of his 19 points in the first half, while the Wildcats' Tyler Herro finished with 15 and Reid Travis had 11. Not much. Tennessee never quit, if one were looking for such a thing. The Vols were physically outmatched Saturday. They needed to keep Kentucky out of the paint, and they didn't. They needed to keep the Wildcats off the offensive glass, and they didn't. Washington did nearly all of his work from five feet and in. Offensively, a lot of the Vols' shots were short. Coming off Kentucky's last-second loss at home to LSU, it was no surprise the Wildcats came out ready to play. The bigger shock was that for most of the game, Tennessee didn't respond well to the elevated level of intensity from both the Wildcats and a raucous Rupp Arena crowd. It's basketball and it's still the regular season, so there's still time for Tennessee to recover, and with LSU and another matchup against Kentucky coming in two of their next four games, the Vols will have opportunities to answer to the questions raised by Saturday's game.